There is a concealed and underreported story of America that must be told. 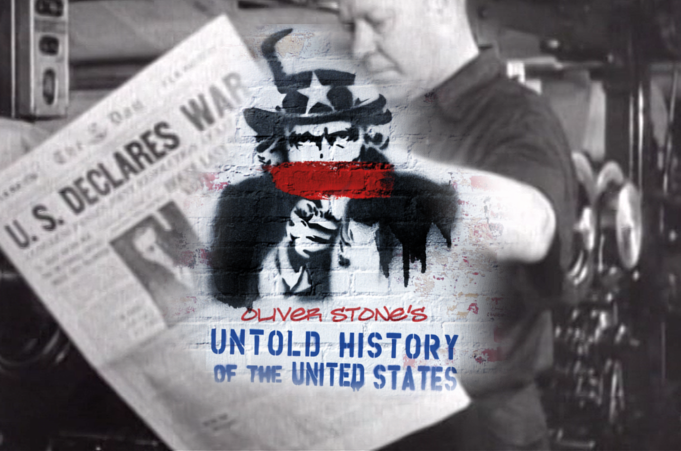 In this 12-part series, Academy Award winning director and writer Oliver Stone questions the historical narrative surrounding the most powerful people and events of shaped America’s complex history in the 20th century. From the end of World War II, the Cold War, and the Obama Administration, this in-depth documentary considers how critical events truly impacted the general public. Oliver Stone is no stranger to the Vancouver Biennale. He hosted the CineFest LIVE program at the Vogue Theatre with two public events featuring a Master Class for aspiring and professional filmmakers at SFU Woodward’s. The legendary director was also presented with the Vancouver Biennale Sorel Etrog Lifetime Achievement Award for using film as a catalyst for learning and social action. We will be a making a new chapter of The Untold History of the United States available online each month. Faculty and students interested in organizing campus or classroom screenings can contact the Biennale at info@vancouverbiennale.com. Anti-intellectualism is evident in the criminal trial of a school teacher conducting lessons on the evolutionary theory of Darwin, while the status of the black person is suppressed with violence. The legacy of the Second World War is confronted with the outcome of anti-Soviet methods and suppression of open discussion on ideology.